Florence International Contemporary Art Biennale is opening tomorrow. My broken ankle was screaming. But once inside my heart was soaring. 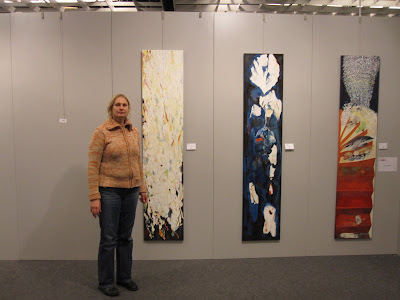 Jennifer Hinrichs and her work. Michael Steinhauser in the entryway. Fantastico. 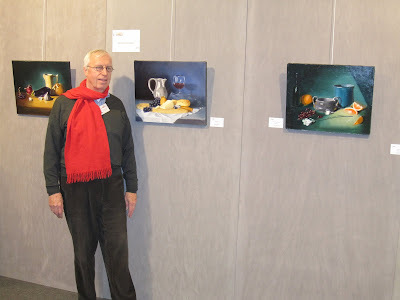 Michael Steinhauser and his work. 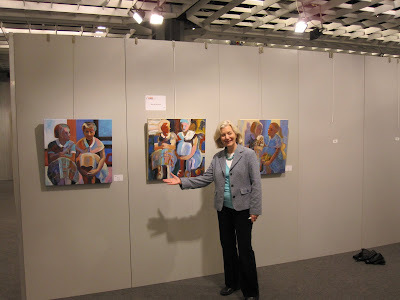 My new friend Stans Bakker from Holland and her work. the radiators and put on the kettle for a nice cup of tea. but the glass, and dome are 100% real. thing. We love Florence. Even, cold and damp she is gorgeous. Labels: Florence Biennale. portraits. wonderful city. Barbara, these pictures almost make it as good as being there with you. Your paintings look so fabulous seen all together. Have a wonderful trip and take care of that ankle. Cool show, I wish I could see the entire thing. Good luck! Barbara, Your work looks absolutely smashing - absolutely! And you look beaming and gorgeous. You look super duper, Barbara! And your work looks great, too! Seems like a really good hanging place with lots of wall space around. Sorry to hear about your ankle - hope it doesn't get worse. How nice that you actually met some friends - old and new - and that you find time to blog when there's so much to take in! You are, as usual, amazing! Say hello to Steven from me. Oh, this is so fun--almost like being there! Your paintings look great. All that walking is tough on the ankle--yikes. A dance instructor told me, after I sprained my ankle twice in one month, to practice drawing the alphabet with your feet each day to rebuild and strengthen the surrounding muscles. After all of that walking and stair climbing, you may not want to try this exercise right now, but maybe in the future. Congratulations, Barbara!!! I hadn't checked in on your postings for a bit, so, imagine my delight to discover that you are in Florence and celebrating your wonderful successes! Warm wishes of all that is wonderful for you (& wishes of wellness for you ankle, too!) HAVE FUN!!!!!!! 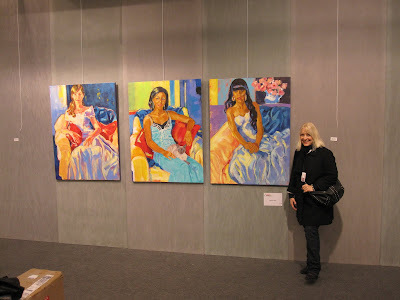 You got a beautiful big wall for your art-the colours vibrate on the grey wall.Great! Oh Barbara, how exciting! Congratulations, and what a treat. Enjoy every moment. Your work looks beautiful. Thank you so much. It has been very exciting. Today was the opening, and we took a delightful little bus ride through the town to the train station near the Fortezza. It's such a big show that I haven't seen the whole thing yet. It's a huge show, and it is cool. Thank you, I think I am already having very good luck. Thanks so much. It has been an exciting day. It is a super fun venue. Today after the official opening -- Men in medieval Florentine dress juggling beautiful silk Florentine flags in the sunlight to incredible drums as we arrived, then speeches in many languages. The champagne and I spent the afternoon talking to people, drawing and having fun with all of the artists in my little area of the giant show. I remember Edgar's blog about the Biennale, and I really think that for the next one of these in 2011 you and Edgar should come. We would have so much fun, and laugh so hard. It has been just super so far, and we are loving the town too. Thanks so much, I really appreciate your sweet comments. You would just love it here, and they would love your work. But what a long way to travel just to be with friends, eat great food, be inspired by fantastic art and architecture -- wait a minute! It sounds like you should do it. Everyone gets a big wall like this -- and the grey wall is covered with something that feels like velvet. Thanks so much. The whole experience is actually just amazing. First coming for the Biennale a massive art show -- then we have never been to Italy before, and here we are living above a castle and in the city where most of the art I studied in art history resides. Wow! In two days we have convinced ourselves that this is our real life. Not true of course, but it feels completely right. Barbara, Your work looks AMAZING!!! I'm so glad you are there!! The staircase looks great too!! I wonder if soaking in Espon Salts would help that ankle....and get out of those stilettos too. LOL. O how I wish I could be there with you! Say hi to Steven, Jennifer and Micheal! I simply can not decide which looks better- you or your paintings. Both! This was a great choice to hang together. Very strong. You look splendid and I hope you are having as much fun as you absolutely deserve to be having. Thinking of you and wishing the best! Hi Barbara. How exciting to show your work in such a beautiful place and to meet all the other artists! 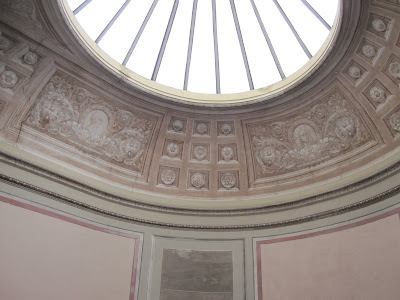 Your photos are wonderful; Florence is one of my top to-visit sites ... someday! I have to write everything at an internet cafe with people waiting, so forgive me for not commenting now. I am going easy on the ankle but seeing a lot. history and beautiful art everywhere. yes this should be one of your must sees, and over and over. Once is not enough. Wow wow and more wow! Beautiful work, beautiful show, beautiful soul!